Several websites devoted to bikepacking do not only show innovative builds but also feature interesting gear on how riders carry cargo…though several prominent brands such as Revelate Designs, Porcelain Rocket, Apidura, Ortlieb to name a few, are prominent brands that consistently show up with these dream builds, Filipino cyclists often are often discouraged because of the steep prices of these brands charge. 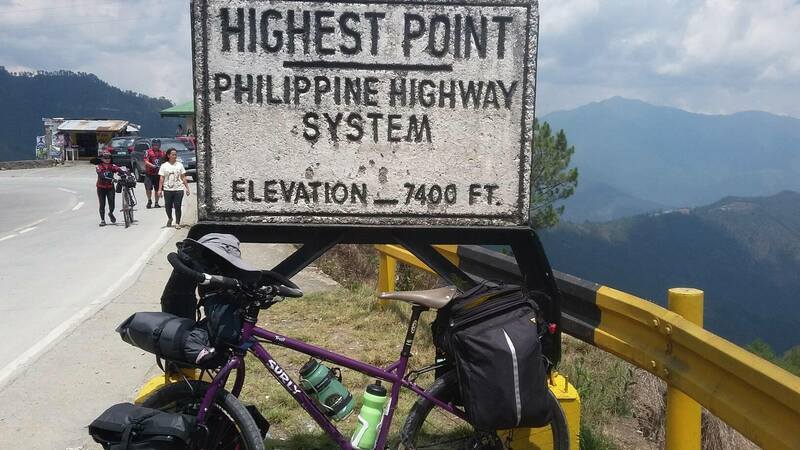 What complicates matters is that though there are many bikeshops around the metro, very little is offered in terms of quality bike commuting or bike packing systems leaving the Filipino cyclist with very little options. The growing popularity of biking to work or even bike touring has sparked innovative inviduals and local companies to come up with the solution of providing quality cargo hauling gear for those who dream of going places on two wheels with the right price. But before you go out and get these bags, there are several considerations that you should think about before investing…Of course what I share comes from insights I’ve gained through numerous rides trying some of the stuff these bike bag makers have to offer. For bike bags, waterproofing and sturdiness are some of the features you’d want to look out for whenever buying. There are bags that are water resistant-meaning they will hold your stuff dry when exposed to light rain and water proof-meaning even when exposed to heavy rain, they keep your gear wet free. Though most bike bags are water resistant, it would make more sense if you get those that are water proof to save your gear from damage and time from dismounting from your bike to put rain covers on your bags. Sturdiness is also important for bags so it wont break down on you during a trip. Particular here are bags that use zippers and structural shell of bags. For instance, rack bags when loaded can put a lot of stress of zippers causing damage and exposing your stuff to the elements. Likewise, a weak internally constructed bag may give out along the way. 22 dryfit shirts fit in their saddlebag! Ive owned all bags previously and while ive had issues with the saddlebag and handlebar bag, the fuel tank, appears to be a great item in their lineup. A top tube bag that has three compartments, it can store several items and can easily be accessed during rides. If you grew up in the 80s, Khumbmela is part of that generation’s experience with their ever memorable lineup of backpacks and other bags. Designed by Rodel Guinto (he loves coffee outside), the Khumbmela’s bike packing line covers all your rackless bike packing needs (framebag, anything bag, feedbag, handlebar bag)…though earlier versions of the bags use heavier stock materials, the new xpac made bags are not only lighter but feature greater water resistant properties. Recently, they have launched their pannier set l for those deciding to go with a racked rig. I got my frame bag last year and have done several day trips and a multiday tour to Legazpi, Bicol and under extreme conditions (heavy rain and heat), this keeps your stuff intact and dry. The anything bag is also a good piece of gear that ive used this during bike to work trips and I can say it can hold a lot of stuff. Ive ridden briefly with the panniers and handlebar bag and both seem to hold well. The panniers are made of thick but light stock water resistant material assuring you that your clothes and important stuff don’t get wet under the rain. Equally impressive is the attachment system for these panniers. Similar to Ortlieb, the Conquer Dispatch Panniers fasten securely to your rack when pushed by the handlestrap and can easily be dismounted when pulled. At the bottom part of the pannier, there is a hook which can be easily adjusted to fit a variety of racks adding more stability to the panniers. Produced in Cebu, Pacgear produces custom made framebags and saddlebags. Too bad I haven’t had the chance to get a hold of their products, their demonstration videos have shown that their stuff is robustly made as well as waterproof (they even have a video of spraying their framebag with water! )Also a popular brand in mountaineering, their bags are made of thick, waterproof fabric. With the possibilities of customization, they can design your framebags for a perfect fit for your rig.